You're about to discover that you don't know where the hell you are. Six new stories from Charlie Brooker come to Netflix this week. To celebrate, we have a new featurette called Cracking Black Mirror. It delves into this terrifying technological hellscape with cast interviews and never-before-seen footage. The Future is Bright. And it's almost here. This Friday, October 21st, Netflix will premiere the anticipated third season of the critically acclaimed Black Mirror, globally. In advance of the premiere, Netflix has just released this all-new sneak-peak that goes deep inside the world of Black Mirror. A few reactions to the new season: "Either you're already obsessed with Black Mirror or you probably haven't seen it yet" - Entertainment Weekly. "Is as biting and sometimes unsettling as ever" - Deadline. "No one has captured [these] fears in as evocative, disturbing, and morbidly funny a way as Charlie Brooker" - New York Magazine/Vulture. "People call Black Mirror the 21st century's Twilight Zone, that's certainly high praise, but the shows ultra-eerie third season lives up to that promise" - Entertainment Weekly. "Powerful and excellent" - Boston Globe. 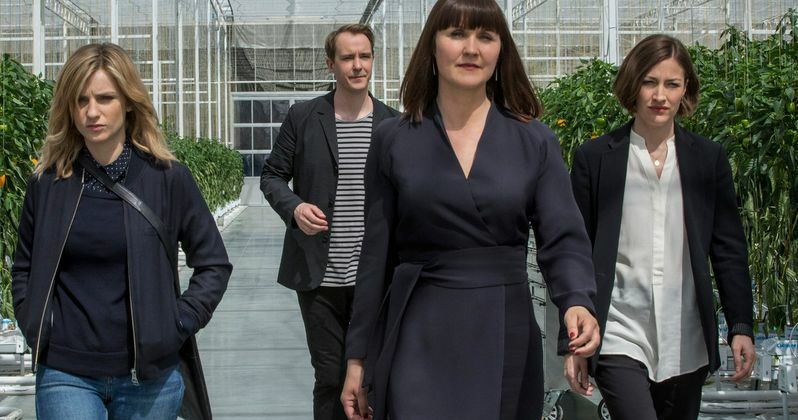 Created and written by Brooker, Black Mirror taps into our collective unease with the modern world and each stand-alone episode is a sharp, suspenseful tale exploring themes of contemporary techno-paranoia. Without questioning it, technology has transformed all aspects of our lives; in every home; on every desk; in every palm - a plasma screen; a monitor; a Smartphone - a Black Mirror reflecting our 21st Century existence back at us. The series has been recognized with an international Emmy Award, a Peabody Award, a Rose D'Or and been nominated for a BAFTA award. The third season features an all-star cast including Bryce Dallas Howard, Alice Eve, James Norton, Cherry Jones, Wyatt Russell, Alex Lawther, Jerome Flynn, Gugu Mbatha-Raw, Mackenzie Davis, Michael Kelly, Malachi Kirby, Kelly McDonald, Faye Marsay and others. Joe Wright (Atonement), Dan Trachtenberg (10 Cloverfield Lane), James Watkins (The Woman in Black), Owen Harris, Jacob Verbruggen (London Spy) and James Hawes direct. Rashida Jones and Michael Schur served as writers on "Nosedive." Annabel Jones serves as co-showrunner and executive producer alongside Brooker. Netflix is the world's leading Internet television network with over 83 million members in over 190 countries enjoying more than 125 million hours of TV shows and movies per day, including original series, documentaries and feature films. Members can watch as much as they want, anytime, anywhere, on nearly any Internet-connected screen. Members can play, pause and resume watching, all without commercials or commitments. Take a look at the latest featurette before diving into all-new Black Mirror episodes this Friday!